Wahama senior Maddy VanMatre (23) slides safely into third base in front of first-year WHS head coach Chris Noble (left), during the Lady Falcons’ 10-4 win on Thursday in Ravenswood, W.Va.
Wahama freshman Bailee Bumgarner (5) snags a flyball during the Lady Falcons’ six-run win on Thursday in Ravenswood, W.Va.
RAVENSWOOD, W.Va. — A surge in the sixth. 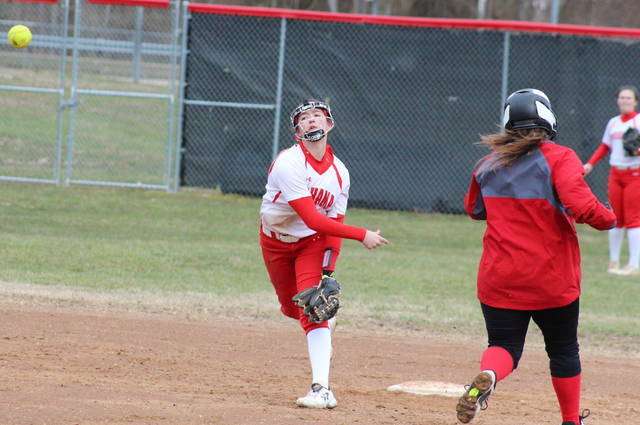 The Wahama softball team trailed by one run after five innings of play on Thursday in Jackson County, but the Lady Falcons struck for eight runs in the sixth inning and claimed a 10-4 victory over non-conference host Ravenswood. 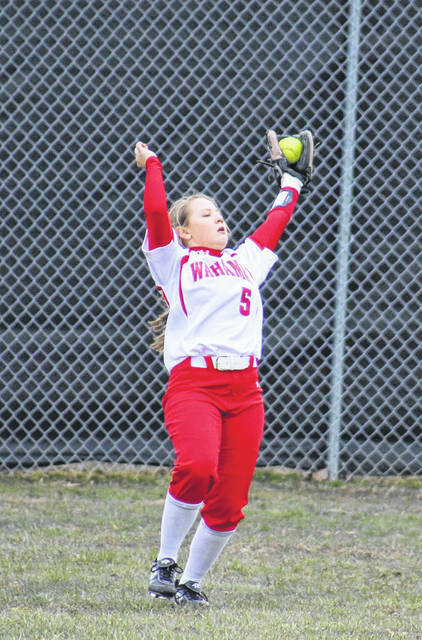 Wahama (3-0) — which opened the season with 13-5 and 21-8 victories over Ritchie County and Buffalo respectively — began Thursday’s contest in style, as junior Hannah Rose hit a solo home run on the fourth pitch of the game. The Lady Falcons wound up leaving a runner on base in each of the first three frames, however, failing to add to their 1-0 advantage. 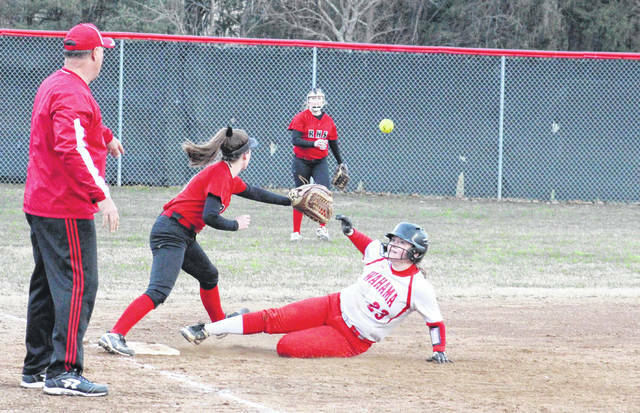 Ravenswood (1-2) — which left a runner on base in each of the first two innings — began the bottom of the third with back-to-back singles by Jamie Naylor and Hannah Smith, and then Kendall Bowen gave the hosts a 3-1 lead with a three-run home run. Wahama got one run back with one out in the top of the fourth, as Maddy VanMatre doubled and then scored on a single by Victoria VanMatre. 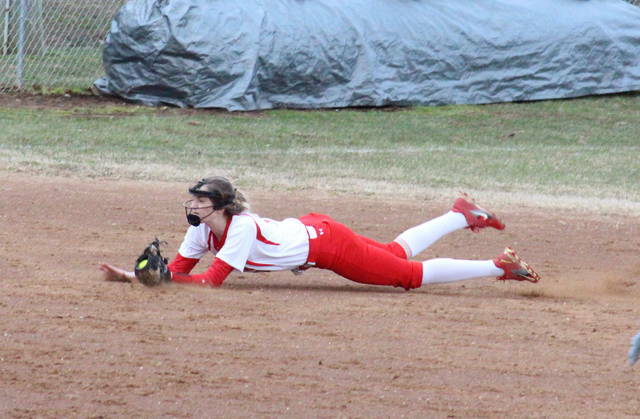 The Red Devilettes had a chance to gain some breathing room in the bottom of the fourth, loading the bases with one out, but Maddy VanMatre made an unassisted double-play to get out of the inning. After being sent down in order in the top of the fifth, Wahama started the top of the sixth with three straight hits, with Maddy VanMatre singling home Emily VanMatre to tie the game at three on the final of the three knocks. After the first out of the inning, Hannah Billups doubled home Lauren Noble and Maddy VanMatre, giving WHS a 5-3 edge. Sill with one out in the frame, Rose doubled home Billups, and then Emma Gibbs singled home Rose and Bailee Bumgarner. The Lady Falcons weren’t done after a the second out of the frame, as Emily VanMatre singled home Gibbs and then scored on a single by Noble. The Red Devilettes got one run back in the bottom of the sixth with Braylin Tabor driving in Jala Sayre, but RHS left two runners on base in each of the final two frames and fell by a 10-4 final. Following the victory, first-year WHS head coach Chris Noble acknowledged the slow start, but was pleased that his club rallied back to take get a win over a fellow Class A Region IV, Section 1 team. Rose was the winning pitcher of record in four frames of relief work for the Lady Falcons, allowing one earned run on five hits, a walk and a hit batter. Billups started in the circle for WHS and took a no decision after allowing three earned runs on six hits in three innings. Both pitchers struck out a batter for the Red and White. Naylor — who struck out four batters for the hosts — took the loss in six innings of work, allowing four earned runs on eight hits. Rylin Tabor pitched one frame of relief for RHS and allowed six earned runs on eight hits. Maddy VanMatre and Emily VanMatre led the victors at the plate, both going 3-for-4 with two runs scored and one RBI. Maddy VanMatre was also one of three Lady Falcons with a double in the contest. Rose hit a home run and a double, driving in three runs and scoring twice in the win. Billups and Lauren Noble were both 2-for-4 with a RBI and a run, with Billups doubling once. Gibbs, Bumgarner, Victoria VanMatre and Tanner King each had a single in the win, with Gibbs and Bumgarner each scoring once, Gibbs driving in two runs, and Victoria VanMatre earning one RBI. Naylor, Rylin Tabor, and Libby Hall each recorded a pair of singles for the hosts. Bowen’s three-run home run was Ravenswood’s only extra-base hit, while Braylin Tabor singled once and drove in one run. Sayre and Smith both singled once and scored once, while Blake Thompson crossed home plate once. Wahama was responsible for the game’s only error and left six runners on base, two fewer than Ravenswood. After a trip to Wirt County on Saturday, Wahama will begin its Tri-Valley Conference Hocking Division season at Waterford on Monday.